02/10/2008 · Dallas, TX · How much should a website cost? Any given web professional can produce an array of pricing models based on the complexity of a project. The amount of time estimated, multiplied by the hourly rates of those involved would probably be the most common approach, and for good reason. Costs should be a trade on efforts, and thus an hourly rate, based upon the quantifiable measurement of the professional’s abilities is the most rational approach. 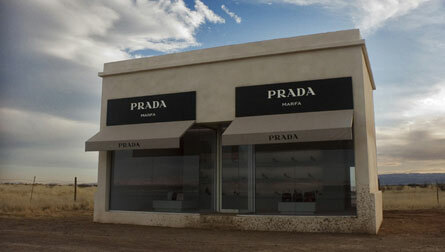 Prada, Marfa, TX. Sculpture by Michael Elmgreen and Ingar Dragse. Photo by John Hicks. Basic economics dictate this outcome: in a free market, clients will pay what they believe the efforts to be worth. Those web professionals that overestimate the value of their efforts should eventually be forced to adjust their prices according to the demand of their services. Unfortunately, in the case of web projects, clients can be ignorant to the elements of a quality web product, and what “should” be charged has been callously misrepresented by agencies and designers. It is these various slight-of-hand tactics that make an honest assessment of rates difficult for honest businesses, and invariably devalues the worth of our profession as a whole. The professional web design community is unfortunately no stranger to looting, and while clients are increasingly aware of how the web can help them, they can still be hazy on the best ways to implement such solutions. This fog of understanding can lead an uninformed, yet otherwise intelligent client down multiple paths to an all out route of their hard-fought budgets. Some projects can grow like a sponge to absorb every last dime, constantly testing the boundaries of the client’s budget, and expanding in any direction where there is give. Ultimately, the client is left with a solution that delivers well beyond their needs (careful: this is not a benefit), with a set of features that they will never use, for a price tag that will take years of careful planning to recoup. Another project can have a very attractive price tag, but ultimately delivers a solution that falls short of the client’s need, causing a second (or possibly third, etc.) investment of time and money to start the whole process over again. An even worse possibility encompasses the most contemptible of the other two, eating years’ worth of budgets, dragging along extraneous time lines, and finally birthing an retardation of the original intent. The destination of any of these damnable routes is a product that is inappropriate, yet must be accepted until the budgets can be replenished for another try. Undervaluing and overvaluing both destroy the true value of creative efforts, prolonging the struggle for honest web professionals to be able to ask a fair rate. Low-cost opportunists have clients believing that simple solutions come with proportionately tiny price tags, while the large interactive agencies have clients believing that true quality and return on investment can only be made through a hefty price tag, and a fully-staffed “team” of professional go-betweens. The result is a bewildered group of businesses in need of a web product, but with absolutely no idea where their project fits within these absolutes. Clients can protect themselves through diligent research, and having a firm grasp of what it is that their web project should entail. What kind of client/server-side technologies are appropriate? What kind of return have others seen on similar projects? They should realize through this process that their particular project does not need to fit in to one of the two aforementioned pricing structures. Also, any honest agency or designer should clear away this confusion upfront, by fully explaining their rates and offering an itemized, detailed estimate of their creative efforts at the beginning of a project. This should ensure a fair appraisal of creative efforts that meets the needs of both the client and creative professionals. This post should not be confused for some rant in favor of regulation: I firmly believe in capitalism, and in asking for the highest reasonable price for any product. A price that is based on anything other than an honest appraisal of efforts, though, and extorted from the uninformed by means of shady, smoke-and-mirrors tactics, should not be misconstrued as mere capitalistic gains. By all definitions, that’s thievery.